There's not a lot wrong with the XSR900, especially in performance terms. The 900cc triple motor is a beauty and provides punchy power right through the rev range. The handling could be sharpened by an aftermarket shock and maybe some work on the front end. But the XSR is not really meant to be a razor-sharp track tool. The model on which it's based – the MT-09 – would be better suited to that sort of use with a few modifications made. The XSR is intended to be a stylish retro version of the MT-09 and as such is as much about style and character as it is about performance and poise. Yamaha provide an exhaustive list of aftermarket parts and I decided it was time for Project Cafe Racer. After much perusing, I decided to go for the a set of drop bars, bar-end mirrors, billet rearsets, new suede seat and seat cowl and a stack of engine and spindle protectors. None of this comes cheap, but it's top quality stuff. The rearsets are £489.99 alone but are made by Gilles and are a work of art. They are much lighter than the standard versions and offer a stack of adjustability. 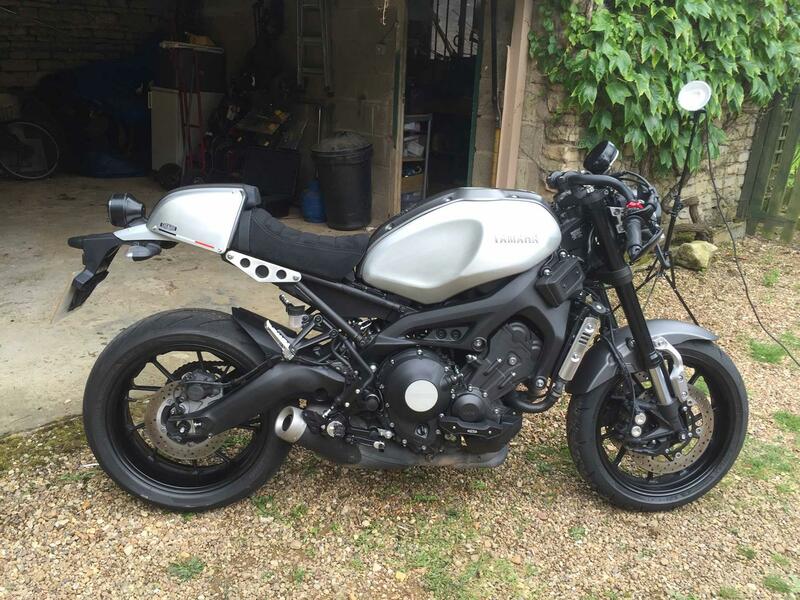 The whole lot is nearly £1500 but it does tranform the bike. Not only in looks, but the bars and pegs change the riding position dramatically. It's great through the back road bends as you feel much more part of the bike, hunched over the tank. Sitting for long periods on a motorway is not quite as much fun as a lot of weight is now put on the wrists. But I reckon with some tweaking of bar and peg position, it should not be a huge problem. I think the seat (£189.99) and cowl (£269.99) look great, while some of the engine protection and the front sprocket cover are a bit pricey – £179.99 and £145.99 respectively. The Rizoma bar-end mirrors are ace. They are beautiful and work a treat – once you get used to looking at your hand to see what's behind you! But they are loads better than the original items. It took a morning to fit everything – with a bit of help from a friend – and it was only really the rearsets that caused any hassle as the swingarm pivot bolt has to come out to get them on. It's early days, but so far I'm really chuffed with the changes. This is the latest example of the increasing number of immaculate cafe racers coming out of America.